• For quantitative determination of superoxide dismutase (SOD) enzyme activity. • Sensitive and accurate. Linear detection range of 0.05 - 3 U/mL SOD. • Convenient and high-throughput. Homogeneous "mix-incubate-measure" type assay. No wash and reagent transfer steps are involved. Can be readily automated on HTS liquid handling systems for processing thousands of samples per day. 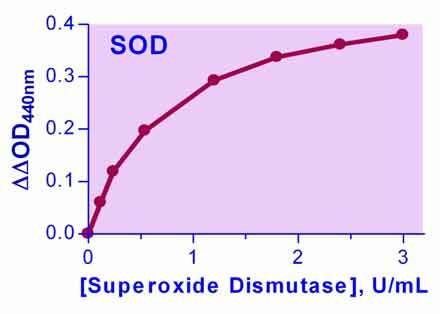 • Superoxide dismutases (SOD, EC1.15.1.1) are enzymes that catalyze the dismutation of superoxide into O2 and H2O2. They are an important antioxidant defense in all cells exposed to O2. There are three major families of superoxide dismutase: Cu/Zn, Fe/Mn, and the Ni type. Aberrant SOD activities have been linked to diseases such as amyotrophic lateral sclerosis, perinatal lethality, neural disorders and cancer. BioAssay Systems SOD assay provides a convenient colorimetric means for the quantitative determination of SOD enzyme activity in biological samples. In the assay, superoxide (O2-) is provided by xanthine oxidase (XO) catalyzed reaction. O2- reacts with a WST-1 dye to form a colored product. SOD scavenges the O2- thus less O2- is available for the chromogenic reaction. The color intensity (OD440nm) is used to determine the SOD activity in a sample. 1. Abdel-Latif, HMR and Khalil, RH (2014). Evaluation of two Phytobiotics, Spirulina platensis and Origanum vulgare extract on Growth, Serum antioxidant activities and Resistance of Nile tilapia (Oreochromis niloticus) to pathogenic Vibrio alginolyticus. Intern. J. Fisheries and Aquatic Studies 1(5): 250-255. Assay: Superoxide Dismutase in Fish plasma (Pubmed). 2. Poontawee W et al. (2016). Protective Effect of Cleistocalyx nervosum var. paniala Fruit Extract against Oxidative Renal Damage Caused by Cadmium. Molecules. 21(2):133. Assay: Kidney Tissue in Rats (Pubmed). 3. Mohamed A et al. (2014). Hemin Attenuates Cisplatin-Induced Acute Renal Injury in Male Rats.Oxid Med Cell Longev. 2014:476430. Assay: Kidney Tissue in Rats (Pubmed). 4. Ahmad, LM et al (2015). Influence of processing and storage on chemical and biochemical characteristics of Mish cheese traditionally produced in Jordan. Quality Assurance and Safety of Crops & Foods: 8(2):243-248. Assay: Cheese. 5. Dura, R et al. (2014). Oxidative stress indicators in patients with prostate disorders in Enugu, South-East Nigeria. Biomed Res Int. 2014:313015. Assay: Cells in Humans. (Pubmed). 6. Jaikumkao K et al. (2016). Atorvastatin improves renal organic anion transporter 3 and renal function in gentamicin-induced nephrotoxicity in rats. Exp Physiol.101(6):743-53. Assay: Rats. (Pubmed). 7. Paul, S et al. (2016). Size restricted silymarin suspension evokes integrated adaptive response against acute hypoxia exposure in rat lung. Free Radic Biol Med. 96:139-151. Assay: Lung Tissue in Rats. (Pubmed). 8. Ismiyati, A et al. (2016). Protective Effect of Vitamins C and E on Depot-Medroxyprogesterone Acetate-Induced Ovarian Oxidative Stress In Vivo. J Toxicol. 2016:3134105. Assay: Ovarium Tissue in Rats. (Pubmed). 9. Kusurkar, TS et al (2015). A glowing antioxidant from tasar silk cocoon. (126): 04563-104573. Assay: Moths. 10. Veri, N et al. (2015). Protective effect of green tea against ovarian and endometrial apoptoses in rats treated with depot medroxyprogesterone acetate. Biomarkers and Genomic Medicine. 7(3): 105?109. Assay: Green tea Extract in Rats. 11. Laili, AN et al. (2015). Protective effect of combined vitamin C and E against ovarian and endometrial toxicity in rats that receiving oral rhodamine B. Biomarkers and Genomic Medicine. 7(4):154-158. Assay: Ovarium Tissue in Rats. 12. Arya, A et al. (2015). NAP (davunetide) protects primary hippocampus culture by modulating expression profile of antioxidant genes during limiting oxygen conditions. Free Radic Res.49(4):440-52. Assay: Cells in Rats. (Pubmed). 13. Struchtemeyer, SG et al. (2014). Survival of the anaerobic fungus Orpinomyces sp. strain C1A after prolonged air exposure. Sci Rep. 4: 6892. Assay: Protein in Angus steer. (Pubmed). 14. Mohammedi, K et al. (2014). Manganese superoxide dismutase (SOD2) polymorphisms, plasma advanced oxidation protein products (AOPP) concentration and risk of kidney complications in subjects with type 1 diabetes. PLoS One.9(5):e96916. Assay: Plasma in Humans. (Pubmed).